Ponds, fountains and other water features are unique and attractive additions to any landscape design. E.L.S. Landscaping has experience with ponds in various sizes. We do not utilize kits or prefabricated ponds, but install ponds using materials specifically chosen for each project. ​Fountains, with their gentle trickling of water over rock or into a basin, add a sense of relaxed elegance to an outdoor setting. 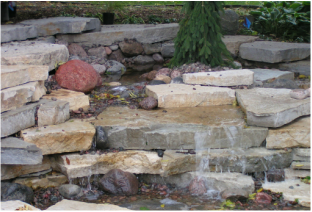 A "pondless" fountain can replicate the ambiance of water moving over rocks in a natural setting by burying the water holding portion of the fountain underground.